Who is it for? 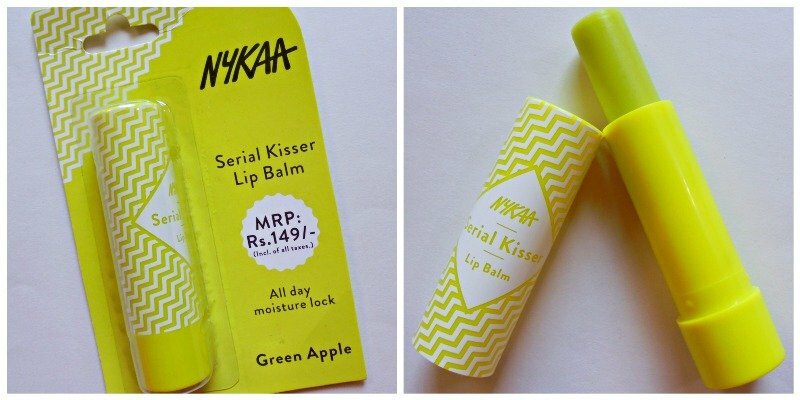 Nykaa Serial Kisser Lip Balm Green Apple is clear lip moisturizing stick for dry, dehydrated and flaky lips. This lip balm comes in standard bullet form. It has fluorescent yellow colored packaging with geometric patterns all over the lid. The bullet has an outer pack which mentions main ingredients and a few necessary details regarding the product. The packaging is small so it is easy to carry around. The balm stick has a transparent finish on the lips through the brand has given the lip balm an attractive fluorescent yellow color. The texture of the balm is moisturizing and the moisture stays for 3-4 hours without drinks or meals. The thickness of the balm is medium; thicker than regular petroleum jelly. It has a sweet green apple fragrance. The candy-like fragrance is not very strong and wears off after some time. I like flavored lip balms with or without tint. I keep at least 2-3 varieties of flavored lip balms and use them alternatively. Nykaa recently launched a range of affordable lip balms and this particular variant comes from that Serial Kisser collection. The entire range has the same formula in each variant just the flavors are different. The formula is very moisturizing. It provides enough hydration to my dry lips. Plus the formula is vegan and paraben free. Altogether it’s a value for money lip balm for regular use. It would have been great if it had some SPF. I would suggest this to anyone who is searching for a paraben free flavored lip balm without tint. I am not a fan of green apple fragrance so I might buy other variants from the same brand and same formula.